The 404 differed visually from its 202 predecessor by the addition of one extra cabin window, and the absence of the cockpit ‘eyebrow’ window. The astonishing success of the Constellation and Howard Hughes’s association with it was followed by the award of overseas routes to Europe (page 50). T. W.A. had won its spurs across the Atlantic Ocean during the Second World War (page 50). When the airline industry adjusted itself to postwar conditions, the airline consolidated its transcontinental net­work, and entered the world’s most competitive air route: between northeast U. S.A. and western Europe. After opening its first Atlantic service to Paris on 5 February 1946 (page 50), T. W.A.’s rapidly-expanding Constellation fleet was soon to be seen in many of the capitals of Europe and as far as the Middle East. T. W.A. reached Bombay on 5 January 1947, and Colombo by the summer of 1953. 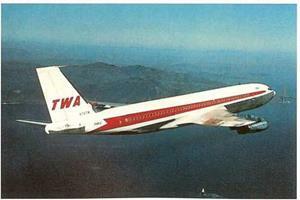 The aircraft carried the slogan Trans World Airline, and this was formally regis­tered as the new name for T. W.A. On 17 May 1950. On 25 April 1956, the C. A.B. Examiner approved an extension from Colombo onwards to Bangkok and Manila, where the line would connect with Northwest’s trans-Pacific terminal. This would complete the round-the-world service— and challenge Pan American for that achievement. Service opened on 1 October, but was terminated in April 1959, because of dismal load factors on the eastern segments. Still controlling T. W.A.’s fortunes, Howard Hughes was, by this time, facing dissatisfaction within his top management, much of it of his own making. He was increasingly diverted by other interests, mostly of the feminine gender, leaving the day-to-day management to others. In February 1947, his long-time flying associate, Jack Frye, resigned, and took with him chairman T. B. Wilson, and executive vice-presi­dent Paul Richter, who dated back to Frye’s Standard Air Lines days in 1929. Lamotte Cohu became president, but effectively Hughes’s oil-drilling giant, Toolco, took control. Cohu resigned on 1 June 1948, and Warren Lee Pierson took over. Pierson took over once again, only to hand over to Charles S, Thomas on 15 July 1958. In spite of the problems of top management, and pilots’ strikes in 1946 and 1947, the airline made steady improve­ment, matching the competition both within the States and across the Atlantic. On 1 July 1947, Constellations began a transcontinental night service, with only only stop; at Chicago, in an eastbound journey time of just over ten hours. On 1 October 1948, the “New York Sky Chief’ and “Paris Sky Chief’ all-sleeper luxury service opened on the Atlantic route. De Luxe service Super Constellations, starting on 10 September 1952, reduced the transcontinental journey time further, and then, on 19 October 1953, the “Ambassador” service offered eastbound non-stop flights in 8 hours. On 1 June 1957, this was consolidated with Lockheed 1649A Star – liner service. In November 1955, the celebrated Denver Case, decided by the Civil Aeronautics Board, gave T. W.A. the authority to stop at Denver en route from Chicago to San Francisco. Overseas, T. W.A. opened a direct Polar Service from California to London on 29 September 1957. While the airlines were still emphasizing luxury and creature comforts, the balance of air travelling public was changing. The dominance of business travel was giving way to a growing tourist and leisure market. On 1 April 1952, all the members of the quasi-cartel IATA (International Air Transport Association) introduced Tourist-Class fares across the Atlantic; and this was followed by Economy Class on 1 April 1958. As an IATA member, T. W.A. kept pace with the changing fare structures. 880s (at first called the 600 Skylark), in June of that year, ignoring the other established manufacturers of big airliners, Douglas and Lockheed. There was a brief flirtation with the long-range Bristol Britannia turboprop (page 59), but the jets were inevitable, and Hughes ordered 25 more Boeing 707s in May 1957. However, the finances were such that even Toolco, once the almost limitless source of capital, needed help. It came from the insurance giant, Equitable Life, which insisted on a long­term financing plan. This was to have long-term repercus­sions on the fortunes of the multi-millionaire owner. But the show went on. In spite of a company-wide strike in November 1958, the first Boeing 707 was received on 17 March 1959, and put into service only three days later. Facing transcontinental competition from American Airlines, which had started jet service coast-to-coast on 25 January 1959, T. W.A. took a gamble. It operated its New York-San Francisco route for a whole month with only one aircraft; and the fact that that N732TW held out, without a single cancellation, was a great tribute to its engineering staff at Kansas City. They could never have done it with even the best of the piston-engined airliners. An inspection, at least, would have been necessary, possibly an engine change. But the 707’s Pratt & Whitneys held out. This 707 is seen here climbing out over the entrance to San Francisco Bay. The legendary Raymond Loewy designed T. W. A.’s elegant new ‘arrowhead’ cheatline. Pilots were quoted as saying “The jet looked like it was going 600 mph on the ground!" The jet engine, invented by Hans von Ohain in Germany and Sir Frank Whittle in England during the 1930s, was not operational until the closing stages of the Second World War. Most aviation authorities considered that their use would be only for military types because the fuel consumption rate was excessive. But in England, the de Havilland Comet, which first flew in 1949 and went into service with B. O.A. C. in 1952, proved otherwise. The airliner had struc­tural deficiencies, which led to its withdrawal in 1954, but it did prove the viability of jet air­liners in commercial service. The fuel consumption of engines that were designed for economy, not absolute performance, was lower than expected; and the fuel—kerosene, not gasoline— was cheaper. Most important, and not fully realized until the Comet’s service record revealed it, was that the turbine engines did not suffer from the wear and tear of the reciprocating piston – engines; and nor did they have the complication of propellers. The TBO (Time Between Over­haul) of the jets grew in unbelievable leaps and bounds; and the positive effect was also observed in the airframes, where rivets stopped popping as excessive vibration ceased. Americans have always been superb in developing a good idea, whether or not it was invented or innovated at home or abroad. This has nowhere been truer than with jet airliners. Only a few short months after the pioneering Comet was grounded, the Boeing 367-80 made its first flight on 15 July 1954. Little more than a year later, on 13 October 1955, in the order that shook the aviation world, Pan American Airways ordered 45 ‘big’ jets, 20 Boeing 707s and 25 DC-8s. T. W.A.’s first order was placed on 7 February 1956. The impact of the Jet Age, when first, the B. O.A. C. de Havilland Comet 4 started Atlantic service on 4 October 1958, and Pan Am followed on 26 October, was overwhelming. The Boeing 707 was twice as fast and twice as big as its piston-engined predecessors, so that the productiv­ity was four times as great. Yet the world air traffic demand kept pace, thanks to the introduction of economy fares. The Jet Age had begun, and transformed the world of air transport. Sold to Carbourne Corp., 20 Dec 1971. Repossessed and reregistered, 15 Jan 1973. Sold to Israel Jan 1975. Hijacked to Shannon, 1 Nov 1969. Sold to Carbourne Corp., 20 Dec 1971. Reregistered and repossessed, 15 Jan 1973. Sold to Israel Jan 1975. Destroyed by fire after aborted takeoff from Cincinnati. Destroyed by fire on the ground at Indianapolis. All Boeing 707-124s ex-Continental Airlines, sold to Israel Air­craft Industries. 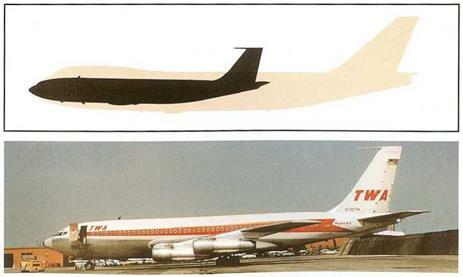 * All Boeing 707-13 IB aircraft (N746TW – N86741) sold to Boeing Military Airplane Co., except where noted. *Two more 707-131Bs, 6760/N760TW (18398) & 6780 N780TW (18399) ordered but cancelled and not built. This eye-catching painting by artist Ren Wicks, captures the glamour of the early jet age, with a T. W.A. 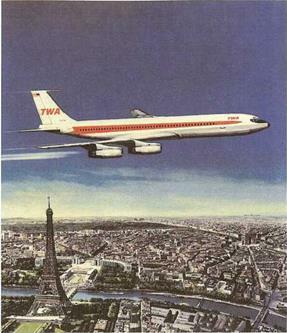 Boeing 707flying (a little off the designated approach path) over the center of Paris.